Konstantin Grcic’s 360ºC chair for Magis is a product that defies classification. It’s a chair that doesn’t look like anything we have around us these days. It’s a bit like stool, but it has a sort of a small back. It looks hard, but it’s actually much softer to the touch than one would thing. As with other of Grcic’s creations, it doesn’t look pretty, luxurious or particularly comfortable. Abitare approached it from a very different angle: taking advantage of the chair’s April launch in Milan, it gathered not only the designer and manufacturer to talk about it, but also called other people to the discussion, which it called “design trial”. Placing the 360º chair as the defendant, Abitare design and architecture editor Anniina Koivu called American designer Jonathan Olivares for the prosecution, MoMA’s curator of architecture and design Paola Antonelli as the defense attorney. The chair’s designer Konstantin Grcic and manufacturer Eugenio Perazza (Magis’ charismatic CEO) were called in as witnesses. The court session can be seen in part on YouTube; its transcript was published in June of 2009 in the printed version of Abitare and can be read in its entirety on the magazine’s website – where there is even the option of downloading a pdf of the article’s pages. This is an extremely entertaining and thought-provoking piece of design criticism. 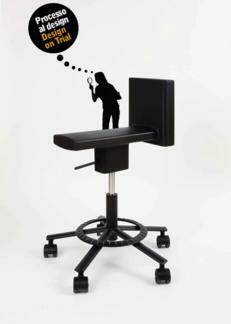 The chair is placed in its historical, use and environmental context; it’s talked about as if it was a real, living being, as it is accused – particularly on the environmental impact of its parts and materials – and defended – the strongest arguments being it’s a new way of sitting and a new interpretation of office furniture. In the end, the defendant is found “Not Guilty”. Design on trial is a phenomenal, engaging way to observe and critique designed objects – and I assume it would also work for built environments – that goes well beyond the usual test-based review. So far Abitare has not published another design trial, but I look forward to the next court session. Next Who’s your cereal bar?